To prevent political parties from luring the voters with free liquor, the Punjab Excise and Taxation Department has formed special teams in all the 117 assembly constituencies. Significantly, more than 60 per cent of the state’s liquor trade is in the hands of politicians and their aides. Describing Jagbir Singh Brar and Kushaldeep Singh Dhillon as "traitors of the highest order", People's Party of Punjab chief Manpreet Singh Badal today said defections by such turncoats would "not affect" the party's prospects in the coming assembly elections. Leader of the PPP Bhagwant Mann today said that either Jagbir Singh Brar and Kushaldeep Singh Dhillon should prove their allegation that he had collected $ 50,000 abroad in the name of the party or be prepared to face a defamation suit. Mann said before going abroad, PPP chief Manpreet Singh had issued strict instructions to all concerned that not a dollar would be accepted from the NRIs towards party donation. He alleged that it was Dhillon who had accepted money from some NRIs on the sly. Mann said he was earning in lakhs as an artist and had joined politics for a cause and not to make money. It is now clear that SAD patron Parkash Singh Badal is the party’s chief ministerial candidate for the coming elections and not his son Deputy CM Sukhbir Singh Badal. An announcement in this regard was made at the Moga rally yesterday as part of a well-devised strategy. The Badals are clearly planning their moves carefully to counter the Congress and the People’s Party of Punjab (PPP). With sitting Congress MLA Brahm Mohindra interested in shifting to the newly carved out Patiala (Rural) constituency (a large number of Samana villages are now under the new constituency), the Congress may have to look for another candidate here. Tarn Taran: Punjab BJP president Ashwani Sharma today said the proposed seat swapping between the ruling alliance partners would “benefit” both the parties. Interacting with mediapersons after addressing party workers here, Sharma said all their decisions were aimed at boosting the poll prospects of the alliance. “We will sort out issues, if any, resulting out of the seat-swapping deal between the SAD and the BJP,” he said. Two protesting Education Guarantee Scheme (EGS) teachers today allegedly made an abortive bid to end their life by slitting their vein atop an overhead water tank at Husnar village near Gidderbaha. Demanding regular jobs for EGS members who had completed elementary teachers' training course, the protesters also wrote anti-government slogans in blood. Identified as Kulvir Singh and Birbal Singh, the duo allegedly tried to commit suicide around 11:30 am after no senior government official turned up to listen to their demands. Continuing with pre-poll bonanza for teachers and other employees, Education Minister Sewa Singh Sekhwan today approved record 4,342 promotions varying from master cadre to lecturer, lecturer to principal and master cadre to headmaster after they were duly cleared by different departmental promotion committees. The State Government has not been able to disburse the salaries of the employees of the defunct Rakhra Sugar Mill from the past 42 months despite making tall claims of initiating unprecedented development in Punjab. Awais Sheikh, lawyer of Sarabjit Singh who is on death row in Pakistan, today said his family should not give up on its efforts and there was need to build international pressure to secure his release. Perturbed over the quality of health services being provided at Government Medical College and Rajindra Hospital, Patiala, around 25 organisations of employees, peasants and students have joined hands to launch an agitation against the deteriorating quality of services at the college. With the Assembly elections round the corner, the state government has directed the Punjab School Education Board (PSEB) to implement its five-month-old decision to grant affiliation or upgrade 1,200 schools across the state. The approval would be granted subject to fulfillment of certain norms. The Punjab Pollution Control Board has decided to install CCTV cameras, along with DVR (digital video recorder), in all highly polluting industries in the state to monitor regular operation of their pollution control devices, both for checking air and water pollution levels. Following a tip-off from an embassy in New Delhi pertaining to the fake education certificates being used to procure a visa, the police has busted an inter-state gang and arrested an MBA student, who earlier worked for a multinational company. Finding fault with an order of the Punjab State Human Rights Commission against a DSP and two other police officials, the Punjab and Haryana High Court has ruled that the commission is only a recommendatory institution. It does not have the jurisdiction to reject defence version furnished by the police officers. The Punjab and Haryana High Court will on Tuesday deliver verdict on the Sehajdhari Sikhs voting rights issue. A 38-year-old woman was bludgeoned to death allegedly by her lover following a quarrel at the busy Baradari Gardens here today evening. Senior excise officers will check inter-state and intra-state movement of liquor as soon as the election code comes into effect. “The Election Commission wants to eliminate the possibility of manipulating votes through free flow of liquor in the light of the fact that more than half of the liquor trade in the state is controlled by politicians”, said a senior officer. Commissioner, Excise and Taxation, A Venu Prasad, said a meeting in this regard had already been held. As per the EC directions, a copy of which is with The Tribune, the production, storage and distribution of liquor during the elections would be monitored by the Excise Department. To further ensure that the department officers perform the task honestly, the Election Commission will tally the production and sale figures with that of the corresponding period last year twice a week. “Further, all the border check posts would be manned by the enforcement staff to check the liquor menace”, claimed a senior officer. The excise top brass has appointed district and state-level nodal officers. “A report on the liquor sales will be submitted every alternate day which would be forwarded to the Election Commission and poll expenditure observers”, said the DETC (Distilleries), LA Khan. Describing Jagbir Singh Brar and Kushaldeep Singh Dhillon as "traitors of the highest order", People's Party of Punjab chief Manpreet Singh Badal today said defections by such turncoats would "not affect" the party's prospects in the coming assembly elections. Brar and Dhillon, founder members of the PPP and the party’s former vice-presidents, defected to the Congress yesterday. Asserting that he would be happy at the exit of other such black sheep, Manpreet claimed the PPP was not a party of leaders but a movement of the people committed to the cause of Punjab. "We will break the monopoly of power-hungry traditional parties, including the Congress and the Shiromani Akali Dal," he said. The PPP chief said what mattered to the party were the masses and not those who treated themselves as leaders. 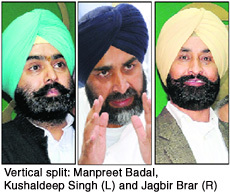 "Our party has forgiven and forgotten both Brar and Dhillon. But the state people will never forgive them for having failed to follow the ideals of martyr Bhagat Singh despite taking an oath at the Golden Temple," he said. Rubbishing statements that the PPP would support the SAD in case of a hung assembly, Manpreet said he had made it clear on several occasions that both the parties could not sail on the same boat. "In that scenario, the PPP will approach the Governor for a re-poll," he added. Leader of the PPP Bhagwant Mann today said that either Jagbir Singh Brar and Kushaldeep Singh Dhillon should prove their allegation that he had collected $ 50,000 abroad in the name of the party or be prepared to face a defamation suit. Mann said before going abroad, PPP chief Manpreet Singh had issued strict instructions to all concerned that not a dollar would be accepted from the NRIs towards party donation. He alleged that it was Dhillon who had accepted money from some NRIs on the sly. Mann said he was earning in lakhs as an artist and had joined politics for a cause and not to make money. “I was one of the highest income tax paying artists in the state before entering the political arena?, he claimed. He showed letters by Manpreet requesting NRIs not to give money to any PPP leader. 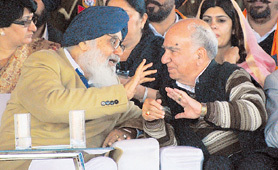 Sitting alongside Mann, Manpreet offered to show mediapersons his party’s account books. It is now clear that SAD patron Parkash Singh Badal is the party’s chief ministerial candidate for the coming elections and not his son Deputy CM Sukhbir Singh Badal. An announcement in this regard was made at the Moga rally yesterday as part of a well-devised strategy.The Badals are clearly planning their moves carefully to counter the Congress and the People’s Party of Punjab (PPP). Though Sukhbir Badal is the SAD president, his father is certainly more acceptable to the senior party leadership than him. Locked in a tough electoral fight, the party does not wish to lose this goodwill. Sukhbir’s political acumen is always compared with that of his cousin Manpreet Badal and projecting Sukhbir as the chief ministerial candidate can split the Akali vote bank, which could prove disastrous in a triangular contest. The SAD’S Moga rally, perhaps not as big as planned, has set the tone for canvassing. Bogged down by the blame game with the Congress and the PPP, the SAD has now realised that it must correct its strategy and stick to the development agenda while cashing in on the anti-Centre sentiment. Projecting Badal Senior as the chief ministerial candidate indicates that he is indisputably the best person to garner votes for the coalition. The CM has opted for a Panthic agenda, inaugurating four Sikh memorials and earning for himself the title of Panth Rattan. Hence, he will be able to garner Sikh votes in a way Sukhbir will not. Sukhbir had recently told The Tribune that he wanted his father to remain active in politics for as long as possible as his mother’s death had left him lonely. One need not read too much into the turnout at the Moga rally. The Akalis are known to be good organisers and the turnout cannot be a barometer of the party popularity. 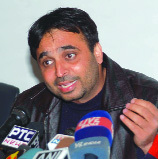 Though Brahm Mohindra has applied for the Congress ticket from both Samana and Patiala (Rural), he has told the party high command about his preference.The MLA has contested six elections on the Congress ticket, winning four times.The primary reason for his losing interest in this constituency is the fact that post-delimitation, the constituency now comprises Akali-dominated areas which have the maximum number of Jat and urban Sikh votes. The SAD has already finalised the candidature of former MLA and Chairman of the Patiala District Planning Committee Surjit Singh Rakhra for this constituency. Promises: As in most constituencies represented by Congress leaders in Patiala, Brahm Mohindra could also not deliver much. Still, he made efforts to ensure that the people in his constituency had access to drinking water and proper roads. He also raised issues pertaining to his constituency in the Vidhan Sabha. Development of backward areas will certainly be the main election issue these elections. Vox Populi: The people of the constituency are all praise for the sitting MLA who has been accessible to them throughout the tenure. "Brahm Mohindra has been visiting the constituency at regular intervals and has been instrumental in spreading awareness among the people on social evils like female foeticide and drug abuse", said a group of youths discussing the coming elections. 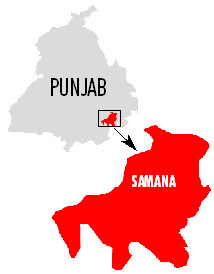 Looking Back: In 1980, Congress candidate Sant Ram defeated SAD's Kirpal Singh by a margin of 11.33 per cent votes. However, Congress lost the seat to the Akali Dal in 1985 with Hardyal Singh Rajla defeating Sohan Lal Jalota of the Congress. In 1992, Amarinder Singh was victorious. In 1997, Jagtar Singh Rajla of the SAD defeated Brij Lal of the Congress by a margin of 30 per cent votes. Sharma claimed the BJP was capable of playing a “significant role” in all 117 assembly seats in the coming elections. Rejecting corruption charges against the BJP leaders in the state, he said the CBI didn’t have any proof to corroborate the charges. He alleged the investigating agency had become a tool in the hands of the ruling Congress, which had been “misusing” it to target its rivals. Two protesting Education Guarantee Scheme (EGS) teachers today allegedly made an abortive bid to end their life by slitting their vein atop an overhead water tank at Husnar village near Gidderbaha. Demanding regular jobs for EGS members who had completed elementary teachers' training course, the protesters also wrote anti-government slogans in blood. Identified as Kulvir Singh and Birbal Singh, the duo allegedly tried to commit suicide around 11:30 am after no senior government official turned up to listen to their demands. Kulvir had been hospitalised at Muktsar, where his condition was stated to be critical, while Birbal was still protesting atop the tank refusing requests to descend. Six activists, including four females, of the EGS Teachers' Union have been protesting atop the tank since Saturday afternoon. The union members have met Chief Minister Parkash Singh Badal and his son Deputy Chief Minister Sukhbir Singh Badal a number of times but their demands still remain unmet. Badal, it has been learnt, had invited the agitating EGS teachers for a meeting in Bathinda today but he could not reach there due to foggy weather. The meeting, therefore, has been postponed. Pritpal Singh, EGS Teachers' Union president, said, "We have intensified our stir as the government is not paying any heed towards our demand. Two of our activists today attempted to commit suicide only to show that we will not budge till our demands are met." Sekhwan said 3,822 master cadre employees, including those of science, math and social studies, had been promoted as lecturers after their cases were found fit for promotion. Similarly, 208 lecturers and 312 from master cadre had been promoted as principals and head masters, respectively. He said another DPC meeting was being called in day or two to clear the cases for 463 promotions of principals from head masters. The Minister said the newly promoted teachers would be allotted their new places of postings in coming days. He said the State Education Department had already promoted and posted 842 head masters from master cadre and 252 principals from lecturers. He pointed out that with this, 5,901 promotions had been done over the past three months. Sekhwan said the SAD-BJP government had already recruited a large number of teachers and that too by ensuring "transparency and merit". Unable to manage their household expenses, the aggrieved employees have urged the Government to release their salaries without further delay. Due to financial crisis, on account of non-disbursal of salary, one of the Mill employees Harbhajan Singh had allegedly committed suicide in January this year. The employees of the Rakhra Sugar Mill include clerical staff, supervisors, skilled and unskilled labourers. Some months back, the State Government had accepted the demand of the employees to give them voluntary retirement. "Only 128 employees were covered under the Voluntary Retirement Scheme (VRS) and relieved from duty on November 25. Funds to the tune of Rs 14.53 crore were sanctioned, but the amount to be given to VRS beneficiaries has not been released", said Faqir Chand and S Yadav, both mill employees covered under the VRS. Secretary general of the Cooperative Sugar Mills Employees' Action Committee, Rakhra (Patiala), Balwant Singh said that the State Government should have extended the option of the VRS to all the 192 mill employees. "The 64 employees, who have been left out from the VRS benefit should be given the same before the imposition of the election code of conduct. The VRS money should also be disbursed at the earliest", he demanded. The affected employees of the Mill also said that while the State Government was claiming that thousands of crores had been pumped for the development of the State, but the reality was that the Government had failed to even pay the salaries to the employees. "In case, the State Government does not cover the 64 mill employees under the VRS, then the salary for the 42 months should be disbursed among these employees without any further delay", said Balwant. Interacting with mediapersons after meeting Sarabjit's family here, Sheikh said the relations between India and Pakistan were improving and it was high time that both the countries took a sympathetic view of the plight of prisoners languishing in each other's jails for years. Sheikh also brought with him the letters written by Sarabjit to PM Manmohan Singh, UPA chairperson Sonia Gandhi and BJP stalwart LK Advani seeking their intervention in securing his release. Sarabjit's sister Dalbir Kaur, who was also present there, said they were contemplating to move the International Criminal Court in connection with the case. On Sarabjit's condition, Sheikh said his health was better and morale high. "He is getting proper medicines. Sometime back, the jail authorities had kept him in isolation in the aftermath of media hype surrounding his case, but now things are getting back to normal." He dubbed Sarabjit a "victim of politics being played between the two countries in the name of prisoners". He, however, said the chances of his release were bright. He said he had ample evidence against the real culprit, Manjeet Singh, whose name figured in the case in which Sarabjit was falsely implicated. Demanding immediate intervention of the State Government to improve services and infrastructure at the 1,000 bedded hospital, the Rajindra Hospital Bachao Action Committee (RHBAC) has decided to launch a series of protest by organising a state-level protest in front of the hospital on December 21. 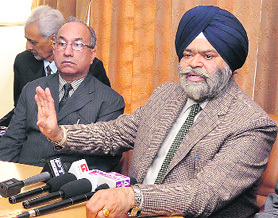 Dr Darshan Pal and Jagmohan Singh, district President and state general secretary, respectively, of the Bhartya Kisan Union (Dakaunda), which is the major constituent of the committee, said the committee was left with no other option but to announce agitation as previous two rounds of negotiations with the hospital authorities had failed to move the latter to take positive steps in this direction. Stating that the health issue is equally important like other issues, including farm sector, leaders added that the BKU (Dakaunda), in its district committee meeting had decided to push all its cadre force in the agitation. "Once considered as a lifeline for patients of the entire south-west Punjab, the hospital, today, is not able to even attend the emergency roadside accident cases, leave alone the breakthrough research and tertiary level medical care," they added. "Despite persuasive efforts, ranging from eminent medical professionals up to various social organisations, the quality of service is going down with each passing year. Therefore, agitation is the only alternative with the masses", said the leaders. When contacted, Dr KD Singh, Principal, Government Medical College and Rajindra Hospital, said he had done best possible within his limits to improve quality of health services. "Ours is a government institute and it takes a little time to change certain things. Still, we have already improved a lot of things, including upgrading infrastructure and creating new wards for adolescents," added Dr Singh. To clear the backlog of applications that have been pending, the Association of the PSEB Affiliated Schools had been knocking at the door of the State Government for the past many years. In July last year, the Education Minister had decided to grant permission for affiliation or upgradation, but the decision was not implemented due to certain reasons. Irritated over the issue, an association of the affiliated schools had recently held a demonstration outside the office of the PSEB. 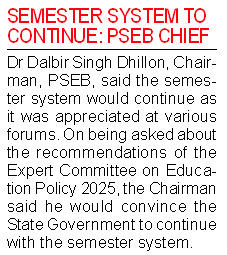 To clear the air on the issue, Dr Dalbir Singh Dhillon, PSEB Chairman, said that subject to fulfillment of the laid down norms that had been relaxed on certain parameters, the inspecting teams of the board would inspect all the schools in the next few weeks and schools would be accordingly granted affiliation. He said pressure tactics adopted by a group of the affiliated schools to get affiliation, without paying any fee, was not acceptable to the authorities. "It involved financial loss to the board", he added. Dr Dhillon said that the Board was ready to grant more time to the schools for meeting the requirements of affiliation. He said that he had constituted a committee under the chairmanship of a retired session judge along with decentralisation of Board's various activities at the district-level. On the issue of about 3,500 private schools being granted associate status at a nominal fee and on the other hand the affiliated schools paying heavy fee and follow strict norms, the Chairman said they were two separate categories of schools. Once the Right to Education (RTE) Act was implemented, all the schools could be categorised into one class and follow same set of rules. Rajinder Sharma, President of the Association of Punjab School Education Board, said decision of the government to affiliate or up grade such schools was pending since the past four months. "We have been fighting on the issue since 2007. On the pattern of government schools, the affiliated schools have been demanding affiliation", he said. Confirming this, PPCB Chairman KS Pannu said that the industries, which would be covered in the first phase, include distilleries, pharmaceuticals/bulk drug manufacturers, paper mills, sugar mills, meat plants and the Common Effluent Treatment Plant (CETP) for electroplating industries at Ludhiana and for the leather complex at Jalandhar. The PPCB Chairman said that all these industries had been directed to get these cameras installed inside the industry premises at prominent locations like bio-reactor to monitor regular operation of aerators, outflow channel/electro magnetic flow meters, chemical dozing tanks, stacks for checking the release of smoke and any other specific site as per requirement. "Though, it is duty of all the industrial units to install and regularly operate the pollution control devices in order to bring down the pollution level within the prescribed limits, but they are not regularly operating them, due to which the purpose of pollution control gets defeated", he said. Pannu said that with the installation of the online CCTV cameras, with backup recording of 60 days, the Board would monitor these polluting industries through Internet. "The right of monitoring through CCTVs has also been given to the concerned Assistant Environmental Engineers, Environmental Engineer, Senior Environmental Engineers and Chief Environmental Engineer", he said. Pannu also said that the industries' owners had been directed to install the CCTV cameras and DVR at their own cost, which would be around Rs 40,000. "The industrial units have been directed that CCTV/DVR should be installed within next 15 days for making the connectivity to the central server of the Board for continuous monitoring at any moment of time", he said, while adding that this step would help in bringing down the pollution level drastically. The Model Town police started investigations and found that the gang members were also operating from Haryana and distributing certificates to anyone in the country for money. Following a tip-off from Delhi, the city police laid a trap and after getting vital details, rounded up a person in a late evening raid. "The accused had prepared a certificate for a student who was caught by the Singapore Embassy while trying to get a visa on fake documents. It was found that the student got the documents from a Patiala-based person", claimed ASI Guriqbal Singh. The accused has been identified as an MBA student from a private university. The police recovered a computer, scanner and some more certificates from him. Sources confirmed that the gang members charged between Rs 10,000 and Rs 20,000 per certificate. Certain stamps used in the fraud have also been recovered and a computer centre in Gurbax Colony has also been sealed. The ruling came on a petition filed by DSP Balwinder Singh, Barjinder Kumar and Sanjeev Kumar Goel against the State of Punjab and other respondents. In the petition placed before the Bench of Justice MM Kumar and Justice Rajiv Narain Raina, challenge was thrown to the order dated November 12, 2009, passed by the Punjab State Human Rights Commission. In its order, the Commission had rejected the defence pleas of the three police officers and recommended to the State Government to initiate department action against them. An interim compensation of Rs 25,000 was also recommended for Vishal Kumar, the victim of police harassment. Challenging the order, counsel for the petitioner submitted: “Once the commission decides that the defence raised by the three petitioners was rejected, this would certainly prejudice their rights before the regular courts of law where they may have to face criminal or civil proceedings.” The counsel added the rest of the order was recommendatory and there could not be “any possible objection”. After hearing the rival contentions, the Bench asserted that it was of the view that the submission made by the petitioner’s counsel on the offending portion of the order deserved to be accepted. “If such a course is adopted, it would amount to adjudication of the rights of the parties and their case before the regular courts might be prejudiced…. The following portion of the order is set aside: The commission rejects the defence pleas of the three police officers. The writ petitions are partly allowed. However, rest of the recommendations would stand”. A three-Judge Bench of the High Court is scheduled to pronounce the orders on a bunch of three petitions filed by the Sehajdhari Sikhs Federation and other petitioners. They are seeking directions to the Union of India and other respondents for quashing the impugned notification issued in on October 8, 2003. The notification debars Sehajdhari Sikhs from voting in the SGPC elections was issued. The accused later tried to commit suicide, but was overpowered by the cops, who admitted him to a hospital in a critical condition. The deceased has been identified as Harpreet Kaur, a resident of Arya Samaj locality of the city. The accused has been identified as Ranjit Singh, a resident of Pedna village. 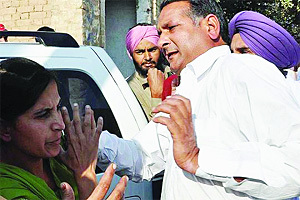 The victim was already fighting a divorce case in Ludhiana with her husband and was staying in Patiala for some years, where she developed relations with Ranjit Singh, the police said. Onlookers said the incident took around 5 pm when the two were sitting in the garden and suddenly Ranjit allegedly took out an axe and slit the throat of the victim and stabbed her several times, leaving her in a pool of blood. “They were shouting at each other and what we could make out was that the accused was angry with Harpreet for not cooperating with him. He seemed to suspect that she was having another affair,” an eye witness said. “After he finished hitting the victim, he tried to commit suicide by slitting his throat, but could not do so as onlookers rushed to save him. However, by the time he was overpowered by the crowd, he had partially cut his throat,” said Devinder Singh, SHO, Lahori Gate, . “We have recovered the weapon used in the crime, though Ranjit has been admitted to a local hospital in a very critical condition,” he added. The police has registered a case under section 302 and 309 of the IPC against the accused. "The accused is under observation and his condition is still very critical. We have sent the body of the victim for postmortem and will record the statement of the onlookers and the accused by tomorrow", the SHO said.